Straight up, I’ll admit that Miku isn’t my first choice for dining. 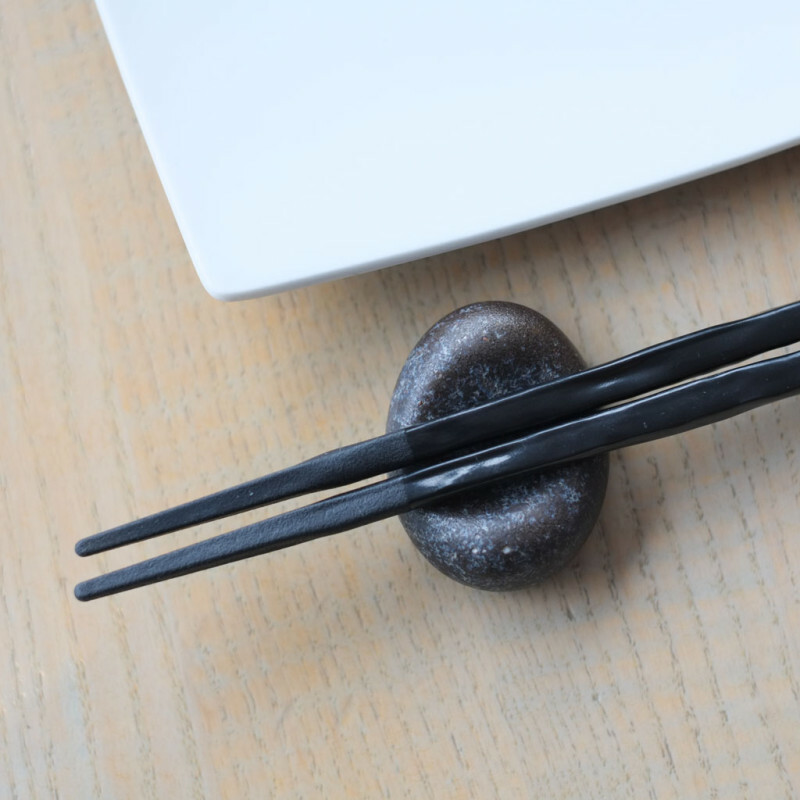 I’ve always felt slightly uncomfortable dining in such a fancy, rich, beautiful restaurant where the Asian 1% dine, but it was a special occasion and we booked the private room, and dammit we had a really good time. The food ranged from good to amazing, and the service was prompt and accomodating. They even have a Strange Fellows beer on tap! Right beside Canada Place (Vancouver Convention Centre East Building aka The Sails), Miku has a great touristy location. But the food is anything but touristy. Unless you’re a rich tourist. We booked the private room for a grad lunch party for a few of the kids in my family that graduated high school. It’s one of the very few fancy non-Chinese restaurant things that we’ve done as a family. 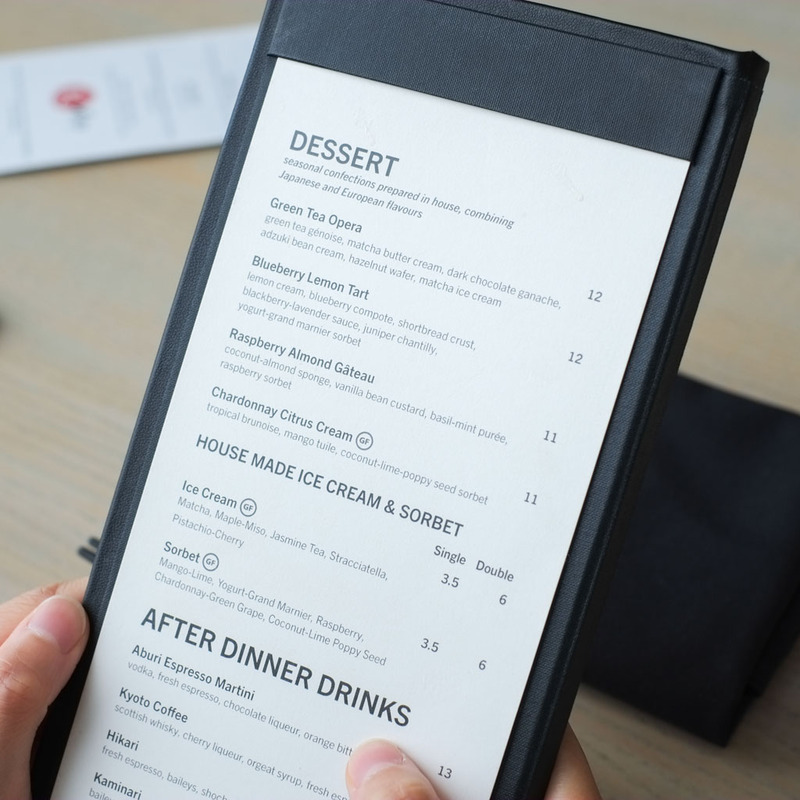 My aunt chose the $38 Lunch Group Menu, which is also listed among other set menus on their website. 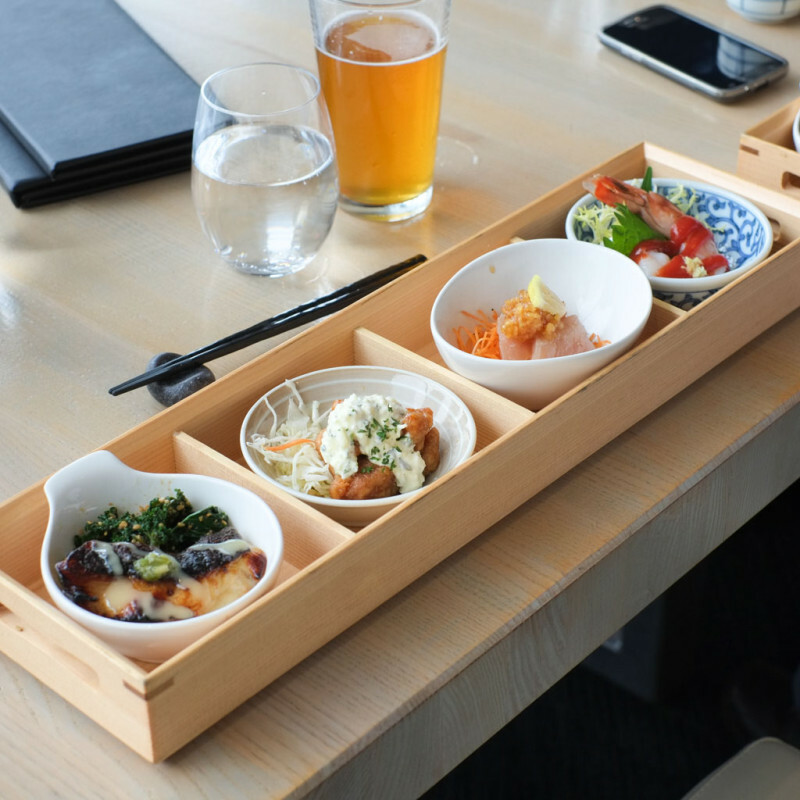 At three courses for $38, it’s actually one of the cheaper dining options at Miku. But we all felt the flavour and value was there, plus the room, view and service was fantastic, so I thought this was great for special occasions. Wicca just had to look at their regular dessert options. 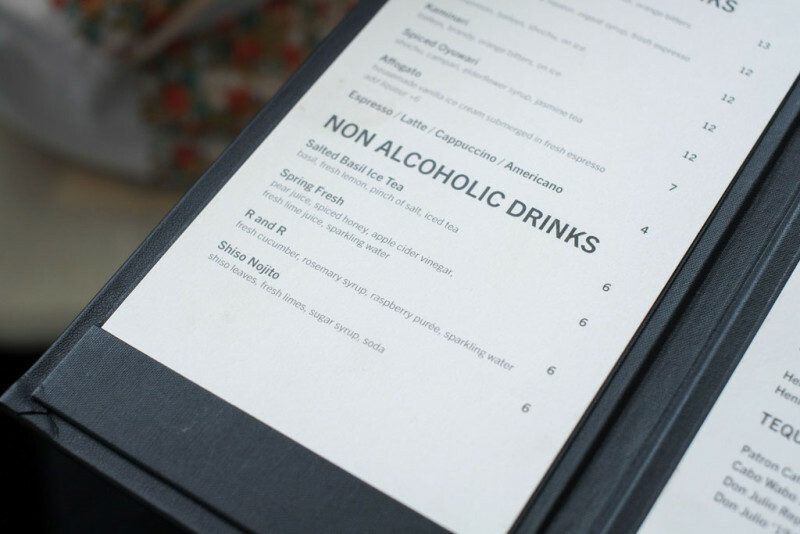 They actually have interesting non-alcoholic drinks too! 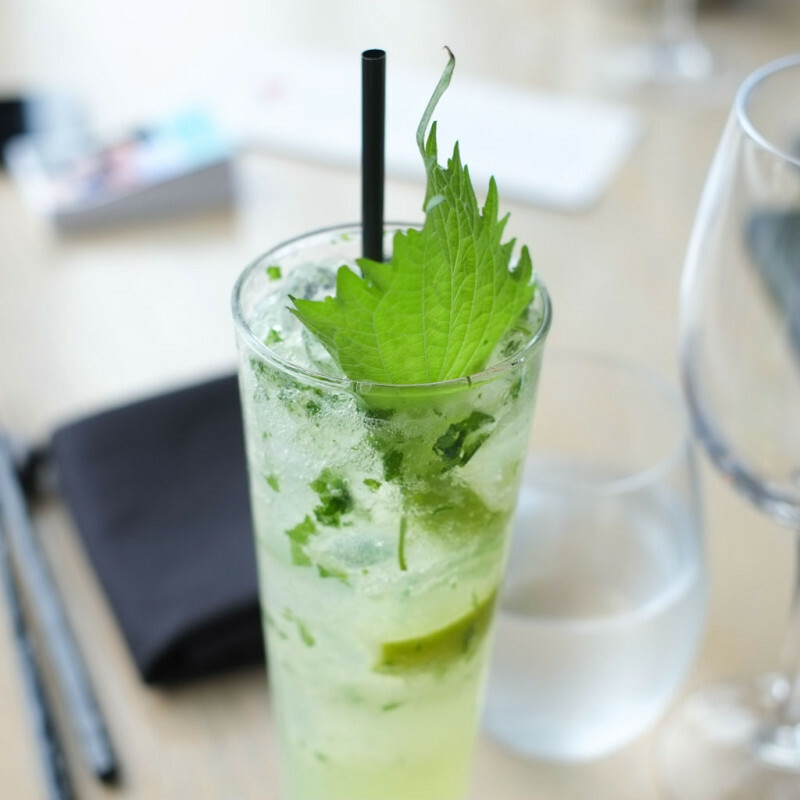 Wicca got the Shiso Nojito, which is like a virgin take on a mojito, replacing mint with shiso. When Wicca orders a drink, you know it’s a special thing. 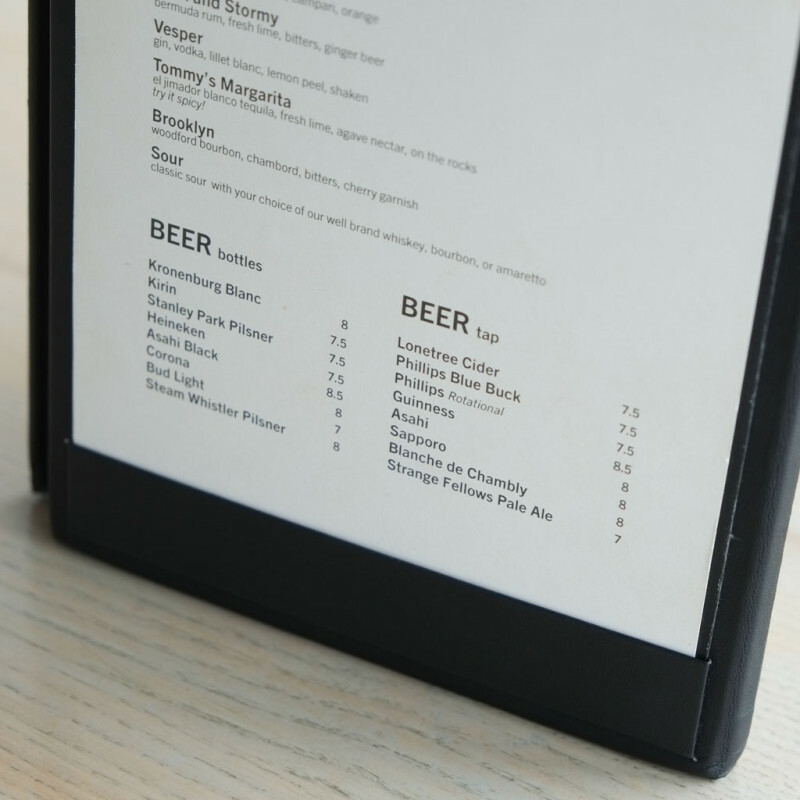 Beer list is serviceable. The Unibroue Blanche de Chambly and Strange Fellows Pale Ale would be my picks for pairing with sushi. It’s very clean, modern, and a little bit slick here. Strange Fellows Talisman Pale Ale ($7). My guess is that this is a 16oz pour. 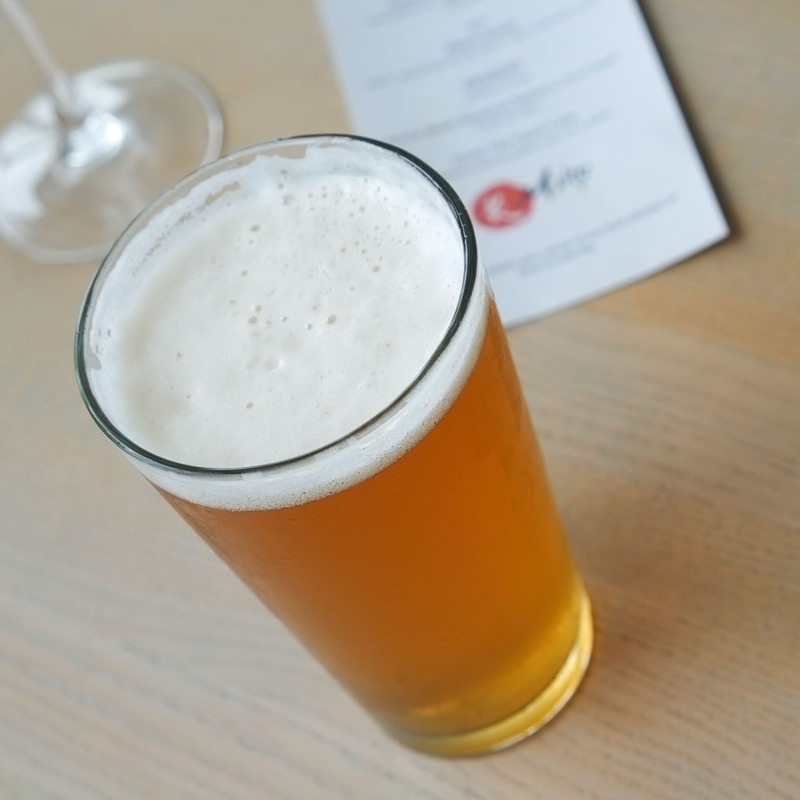 It’s a great 4.2% ABV pale ale with a gentle tropical fruit and citrus aroma. 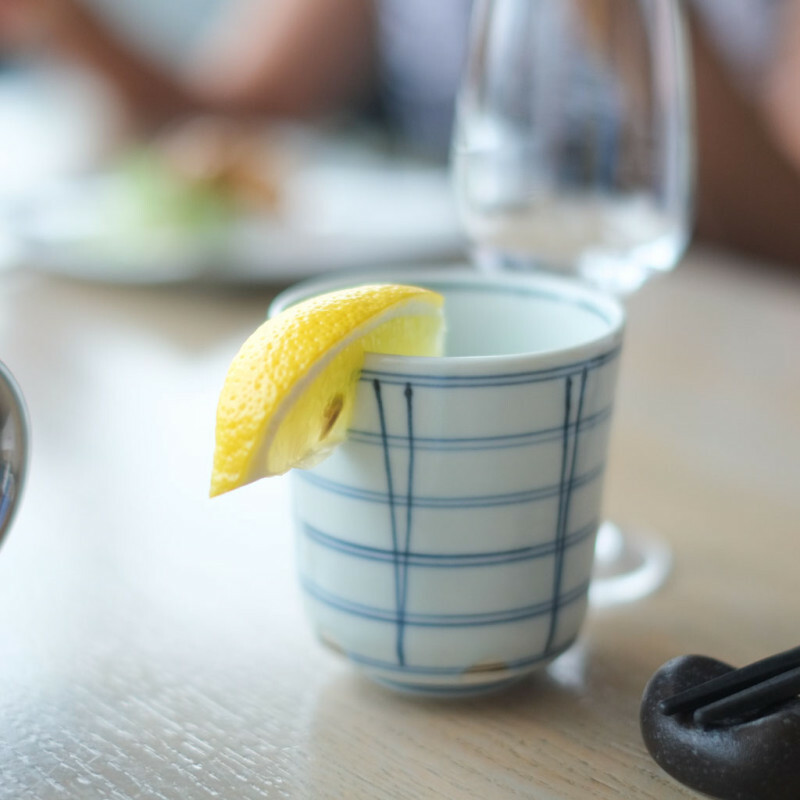 Wicca’s Shiso Nojito with shiso, lime, and sugar. She loved it. I had a sip and it wasn’t too sweet. Not bad to pair with the food. And speaking of Asian parents, how often do you see this? 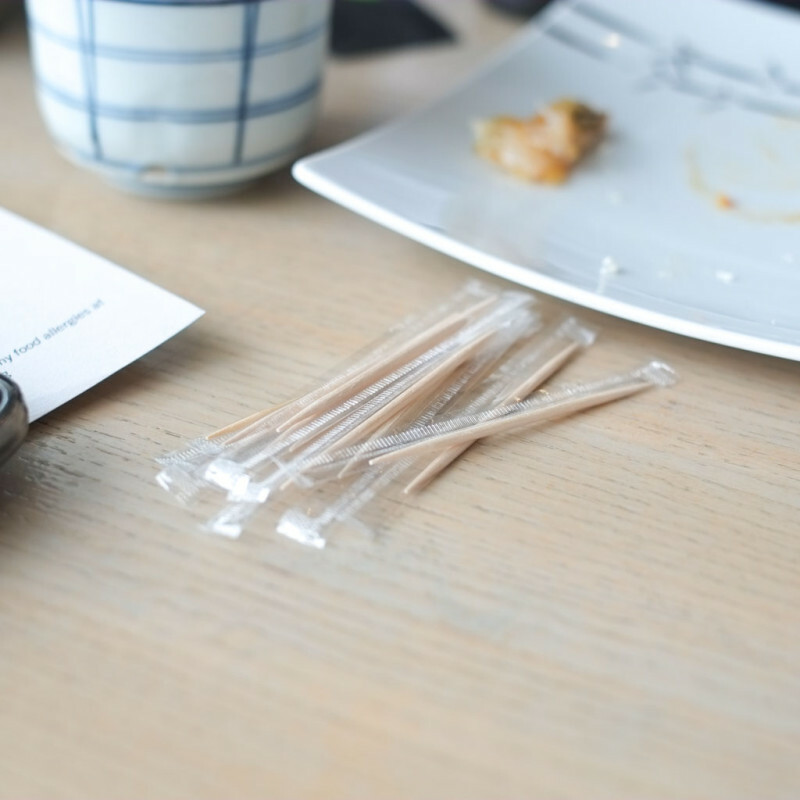 I don’t think my parents have ever bought a box of toothpicks ever. We added a couple appies to share. 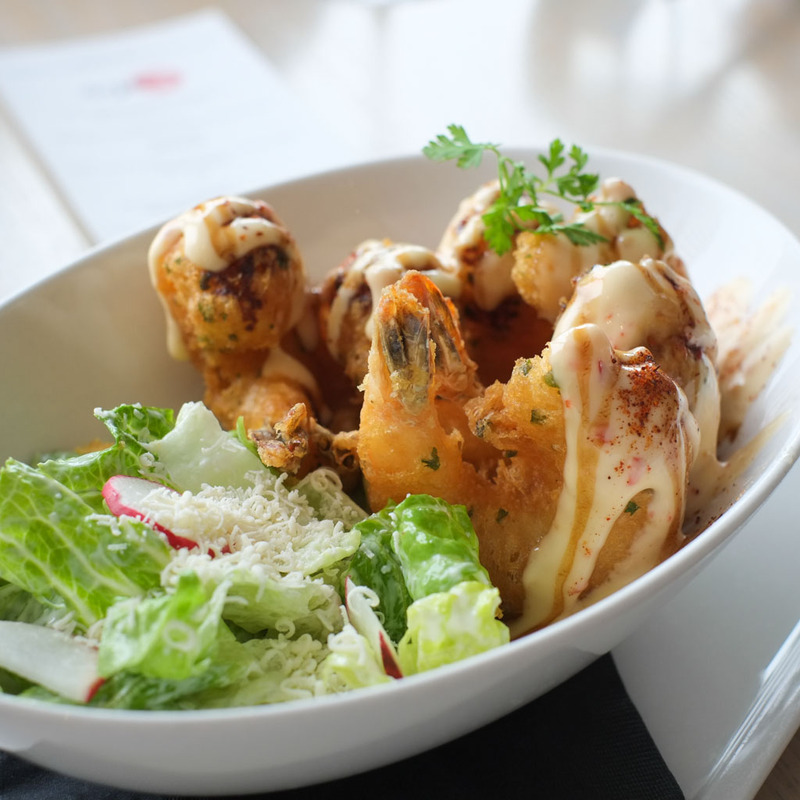 This is the Ebi Fritter, which is white tiger prawns in an herb/beer batter, served with a sweet chili aioli and soy/balsamic reduction. 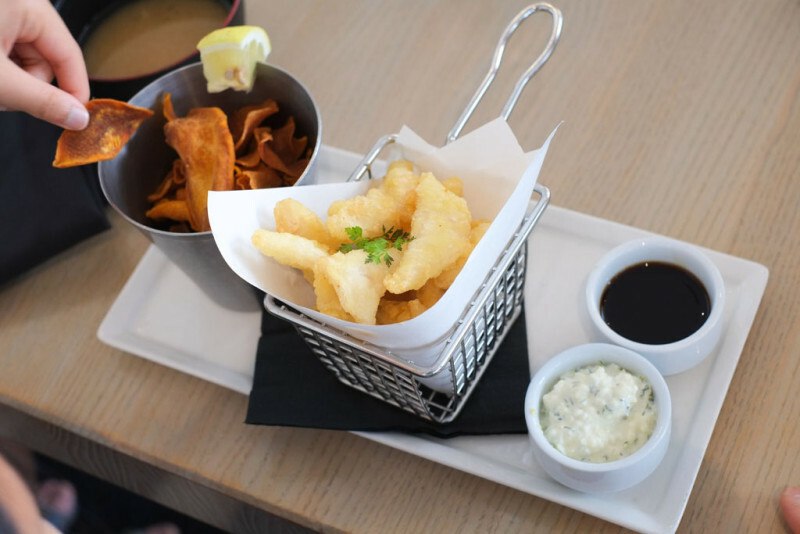 Since it’s a beer batter, it tastes more like fish ‘n chips rather than tempura. 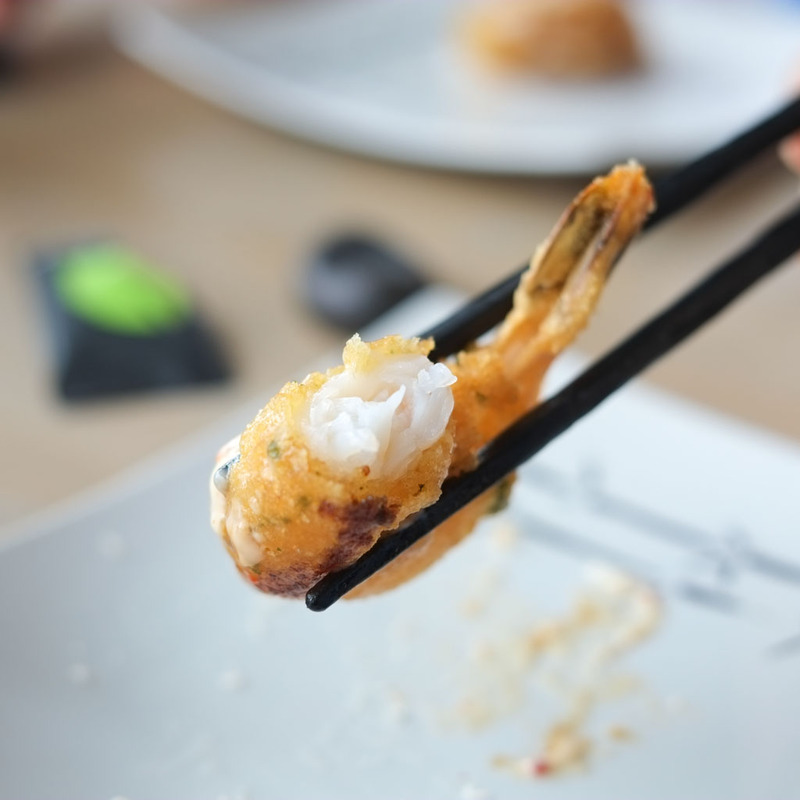 It was crispy and well-seasoned, with perfectly cooked tender and crunchy prawn inside. I love eating the crispy tails! 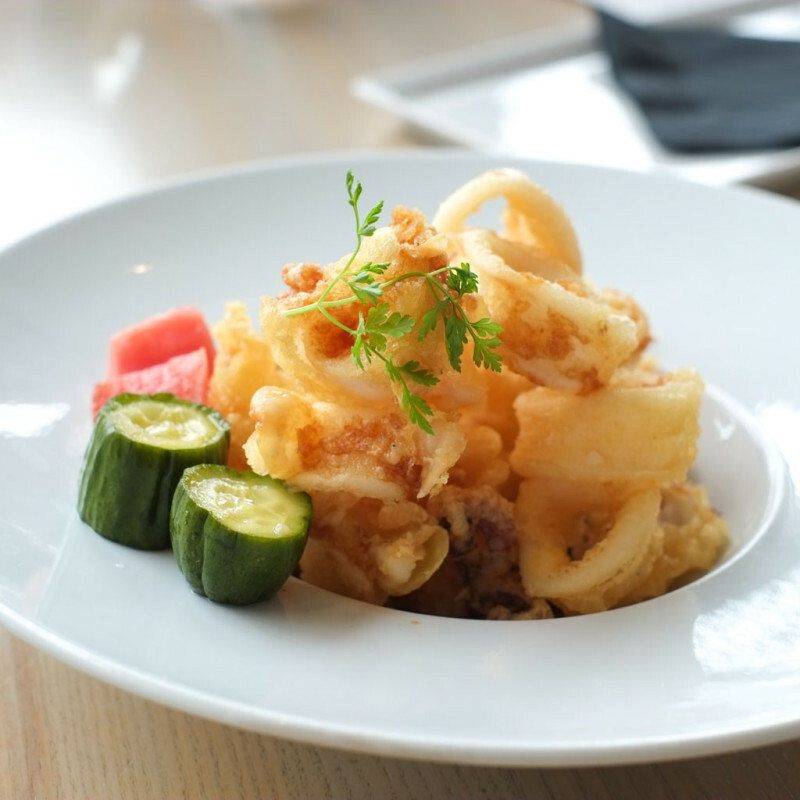 We also added a Calamari which uses a tempura batter. Squid was cooked well (not rubbery) but could’ve been more crispy. Good flavours all around though. Wicca like the pickled beets on the side (the pink heirloom ones behind the cucumbers). One of the youngsters got a Tempura Fish & Chips that had sweet potato chips, some sort of white fish, tartar sauce, and soy/ponzu. She seemed to enjoy it. The set meal has started! Miso Soup with enoki mushrooms. 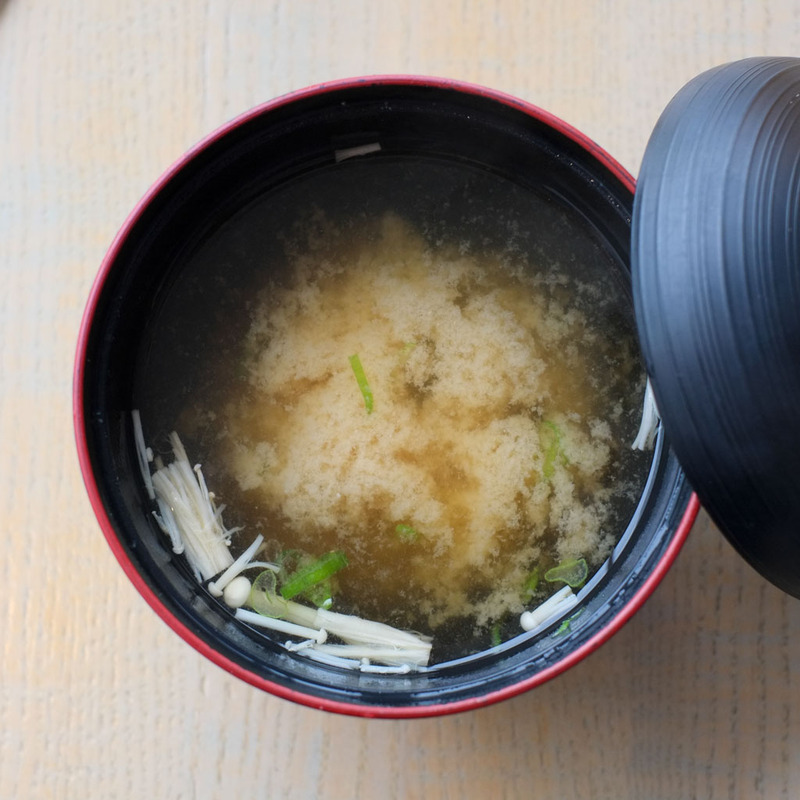 Good standard miso soup, not too salty. 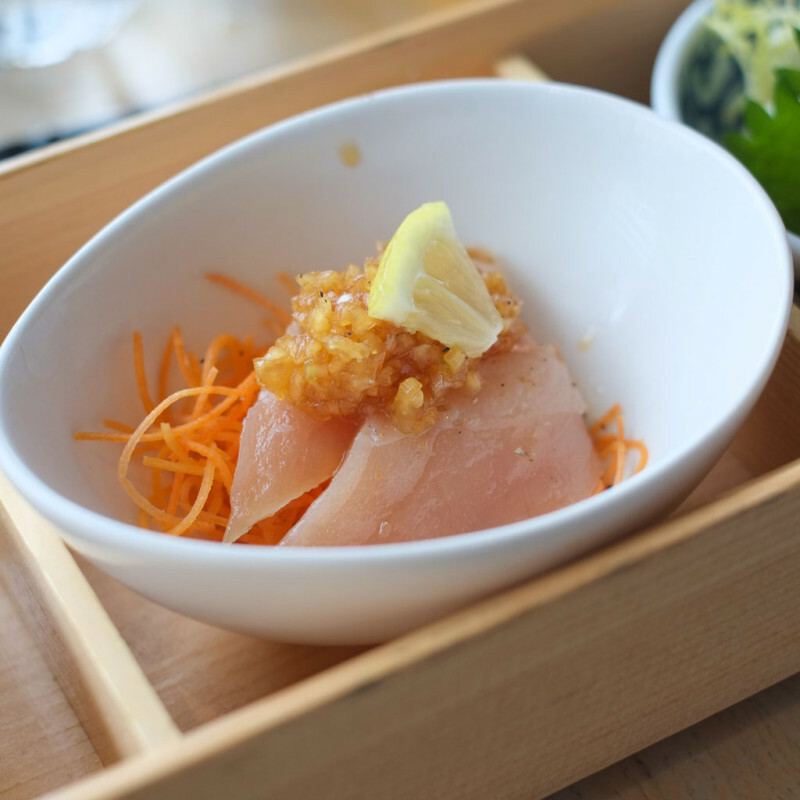 First course with four seasonal items, which they call “Miku Zen“. 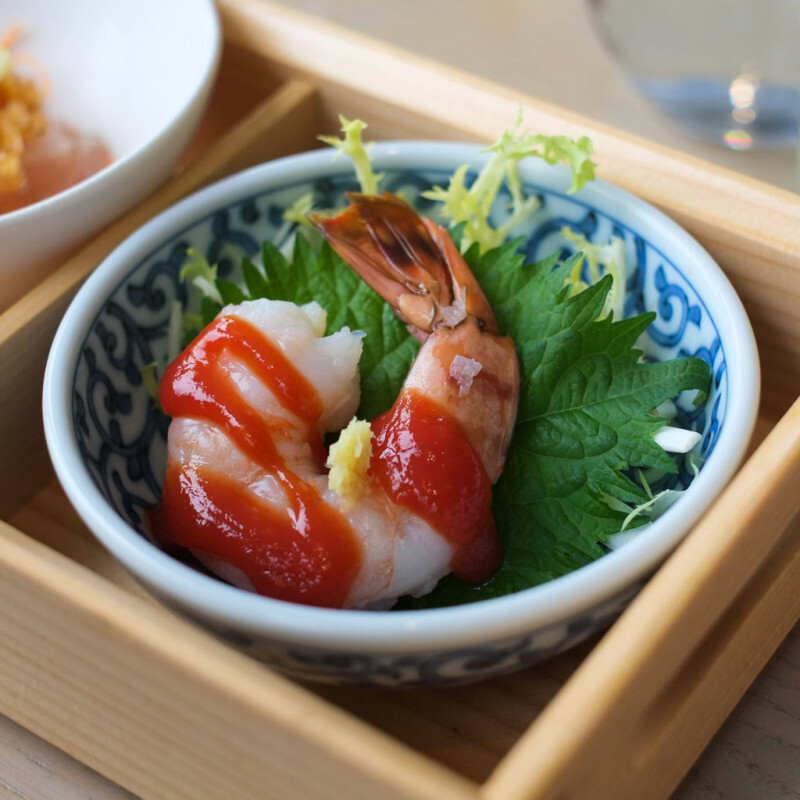 Jumbo Prawn Cocktail with ginger and cocktail sauce, on top of a shiso leaf with frisée underneath. 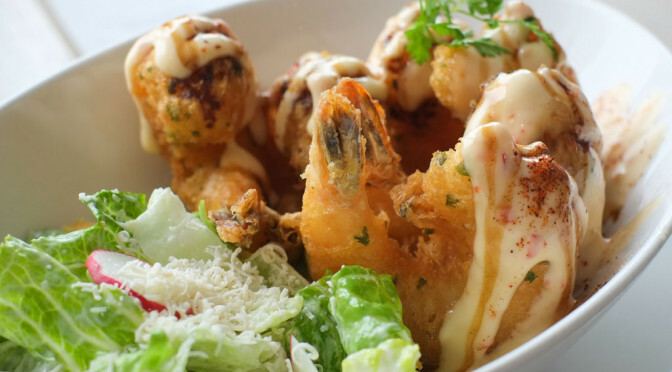 Cold, juicy, crunchy prawn. Yum! Woke up the palate. Aburi Tuna with a “masatake sauce” that contains (we think) onions, garlic, soy and sesame oil. Surprisingly, the onions just tasted crunchy and juicy, without too much of that sharp raw onion quality that Wicca hates. I didn’t see how the “aburi” (torched/seared) element came into this dish, but it tasted wonderful. A generous couple mouthfuls of gorgeous tuna. 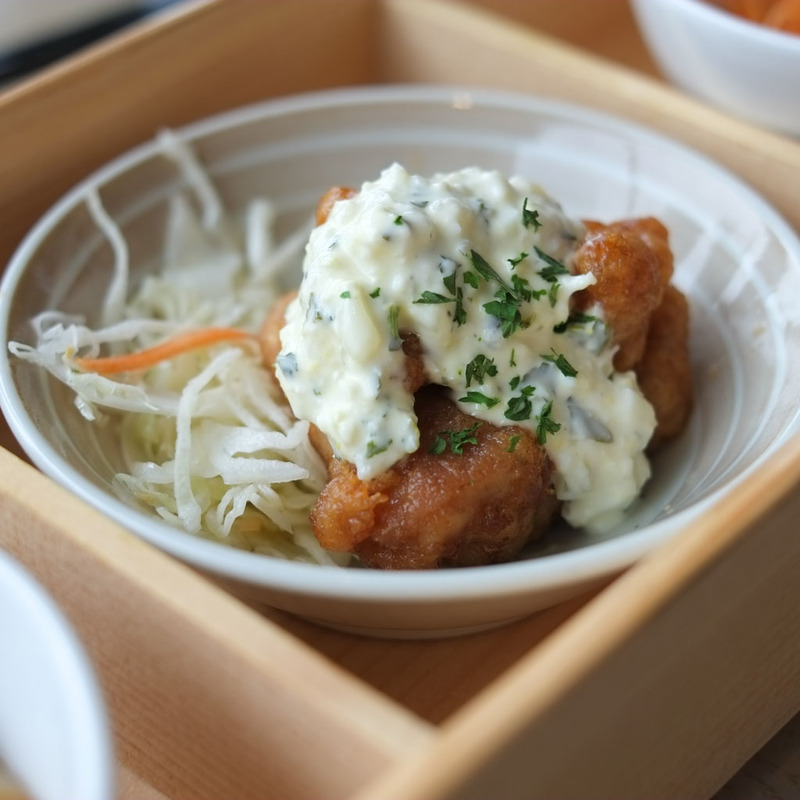 Chicken Nanban which is “lightly fried and marinated in sweet and sour soy” and served with tartar sauce. Basil/citrus slaw underneath. I know this was fried then sauced, but I missed having a crispier coating. But flavourwise it was excellent. It all works together wonderfully, incorporating Asian and (in this case) English flavours. Tartar sauce is English, right? Or just generic at this point? 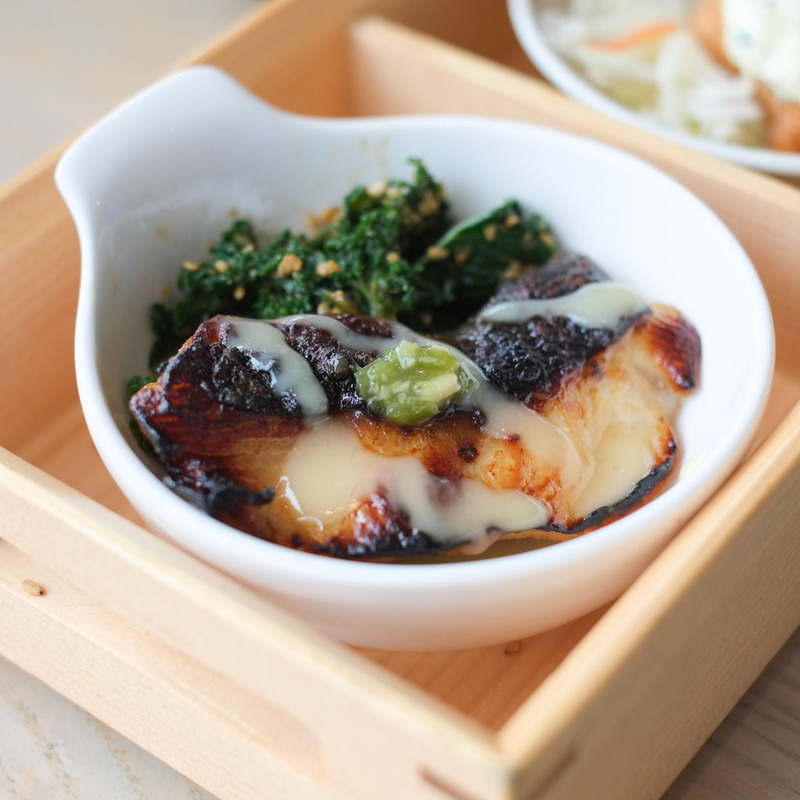 Last part of the Miku Zen course: Saiko Miso Baked Sablefish with kale goma-ae, wasabi pickles, and yuzu miso reduction. This was right up Wicca’s alley. Moist, buttery fish with a heavenly caramelization on the outside. An entree order of this alone costs $23 so getting to experience this dish as part of the Miku Zen set was great. Second course: Aburi Sushi, which includes a couple pieces of their famous Salmon Oshi Sushi (not “oishi”) on the right side. Very delicately presented and precise. 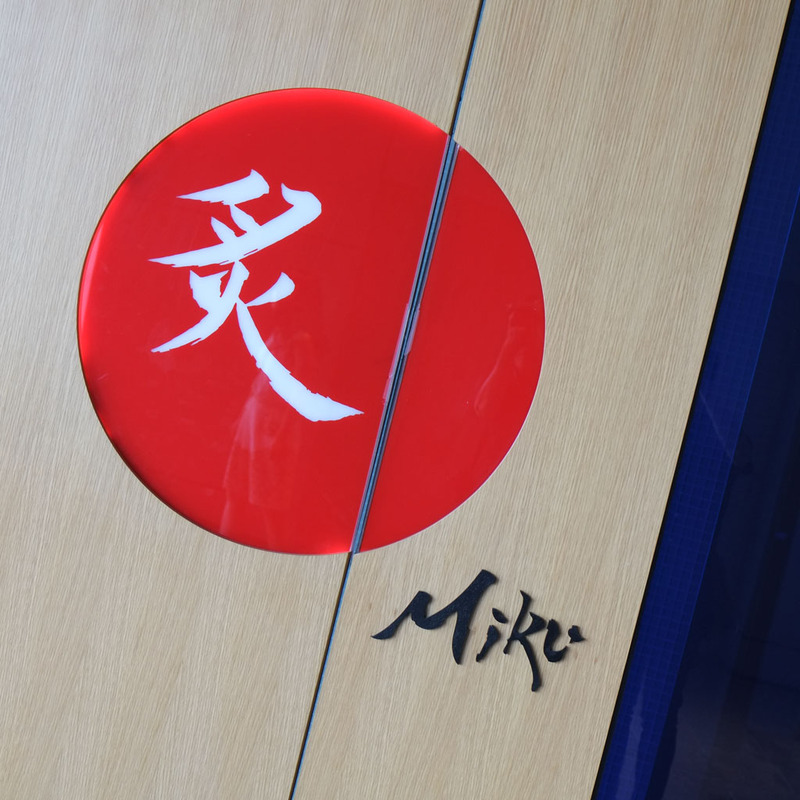 I can see why so many people love Miku’s Oshi Sushi. I liked the sliver of salmon inside the nigiri, as well as the little slice of jalapeno on top. The rice also jumped out at us. It was soft and pleasing to chew, yet each grain still had integrity and wasn’t mushy. The server said that they really pay attention to how they make their rice and soak it for a long time so that it cooks up with this texture. Lovely. 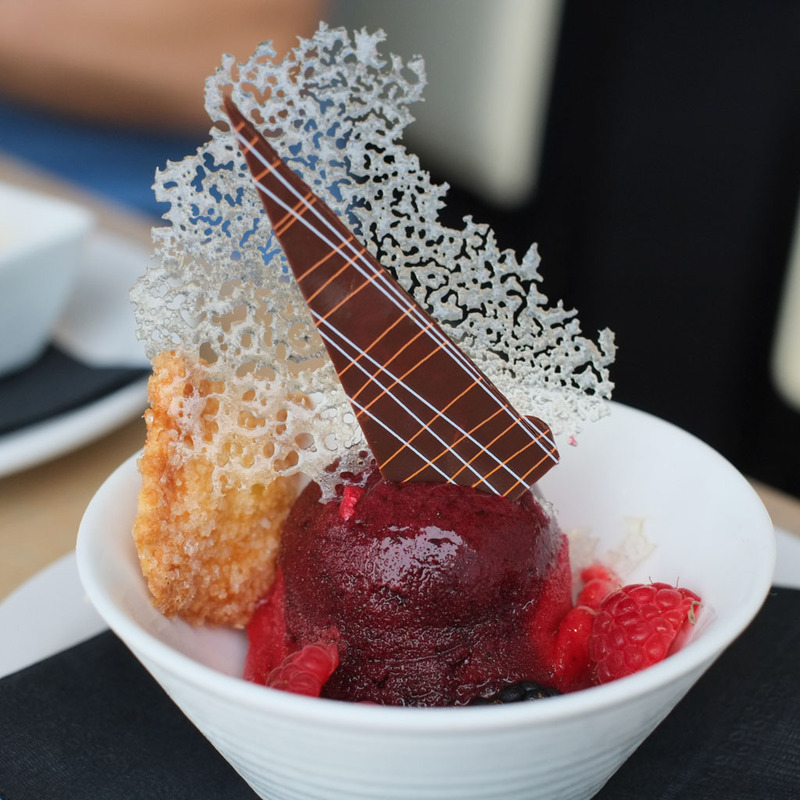 Dessert course: Raspberry Sorbet with fresh berries. My mom ate this one. Looked amazing but I don’t know how it tasted. 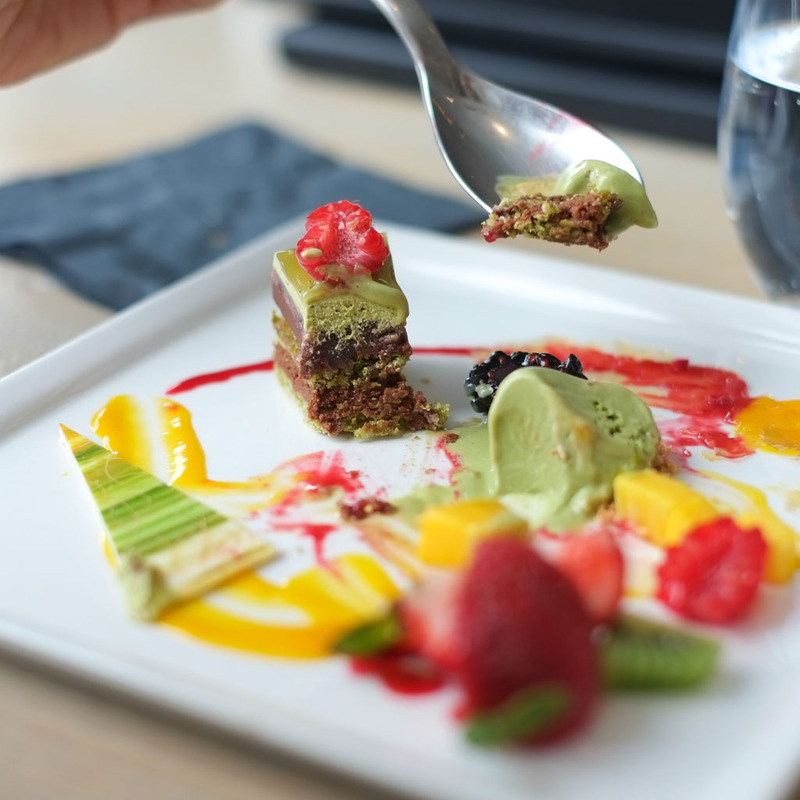 Wicca’s Green Tea Opera Cake with raspberry sauce and green tea ice cream. Man, did Wicca get spoiled this particular weekend. This was the same weekend that we went to Octopus’ Garden for her birthday where she had the big dessert platter, and now THIS! The cake contained: green tea genoise, matcha butter cream, dark chocolate ganache, adzuki bean (red bean) cream, and hazelnut wafer. Lots of different flavours and textures on the plate. 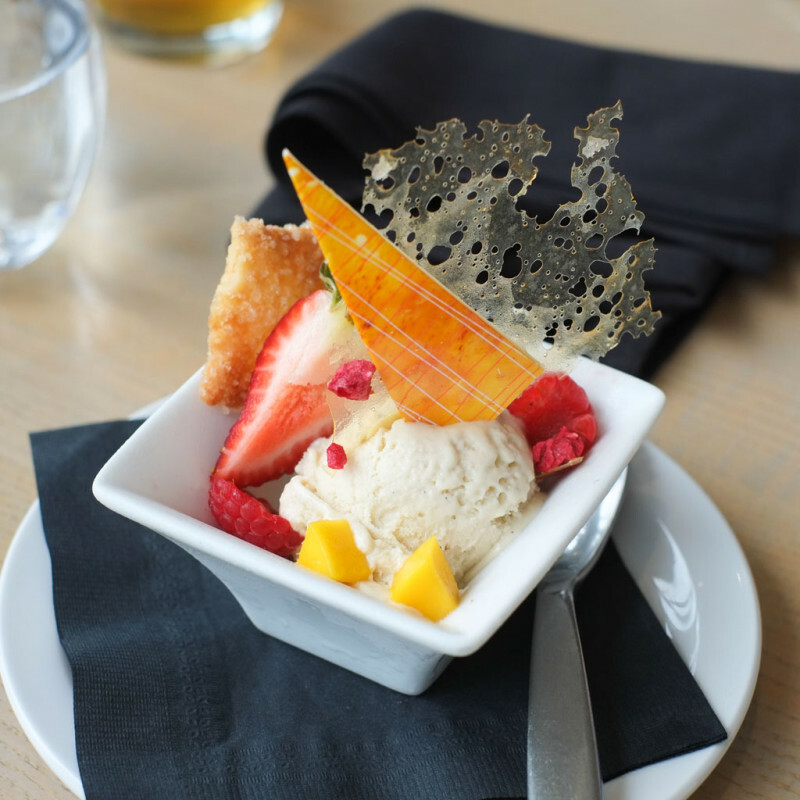 The hazelnut wafer was critical in giving an airy crunch to balance out the rich, creamy textures. And matcha and red bean go really well together. 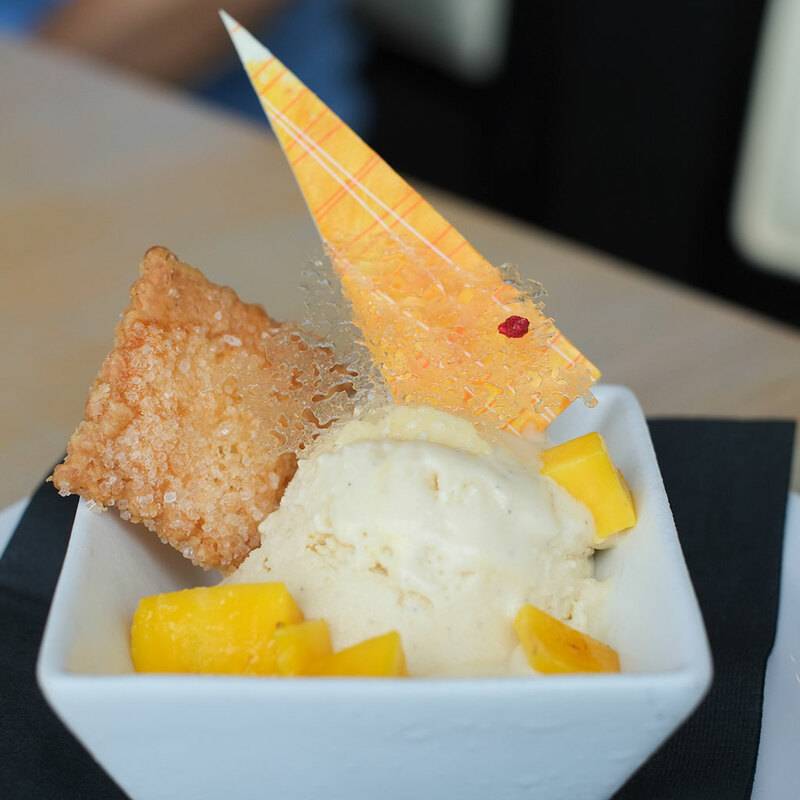 A wow dessert and Wicca wanted even more of it! We were really impressed by Miku. It’s not gonna be regular, casual dining for us cuz it’s on the higher end of things, but for special occasions (or if someone else is paying) it’s great. 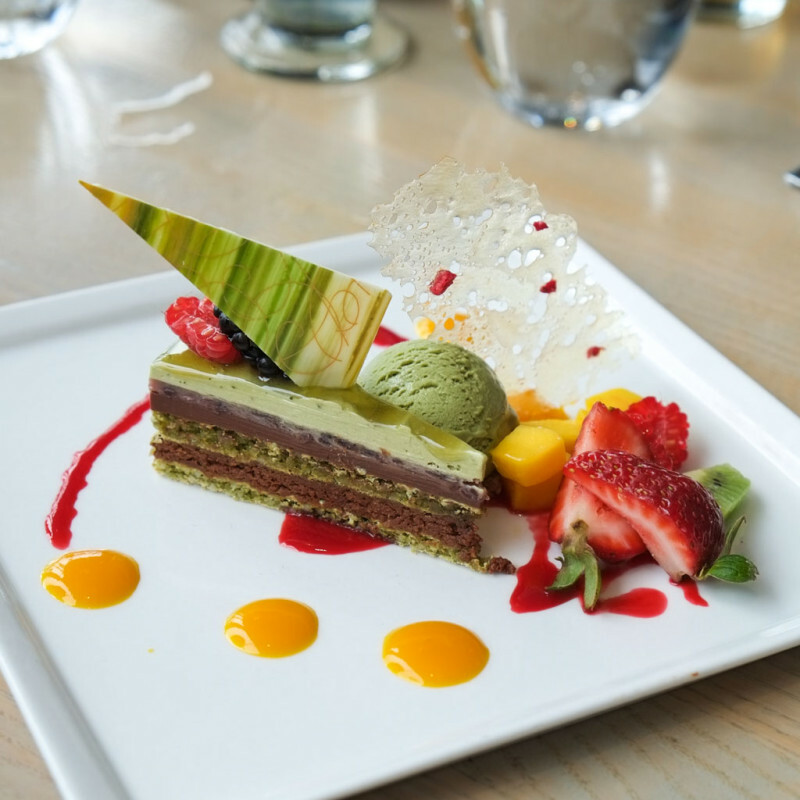 The green tea opera cake is one of my favourite desserts in Vancouver! And I loved the citrus-y marinade and slaw with the juicy nanban. 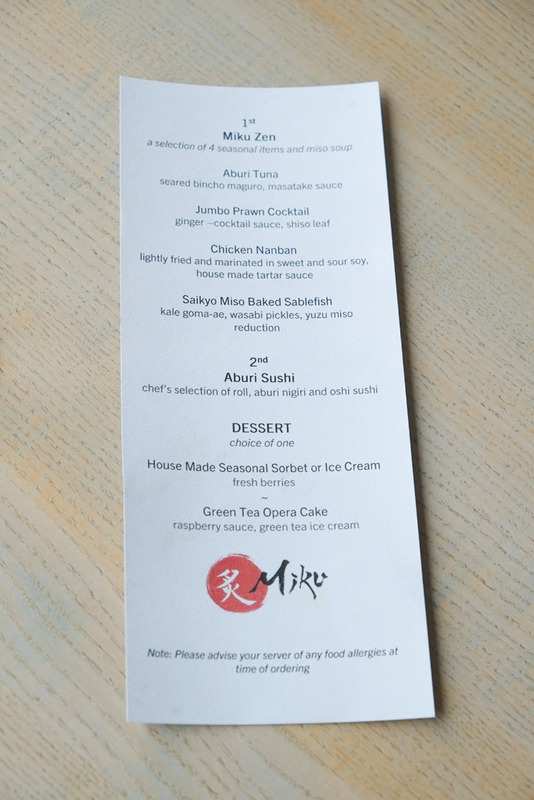 The Miku zen set with the four seasonal items + aburi sushi sampler is on their regular menu for $28 and the Green Tea Opera cake $12 so the savings on the set meal is only $2 but probably easier for group reservations. 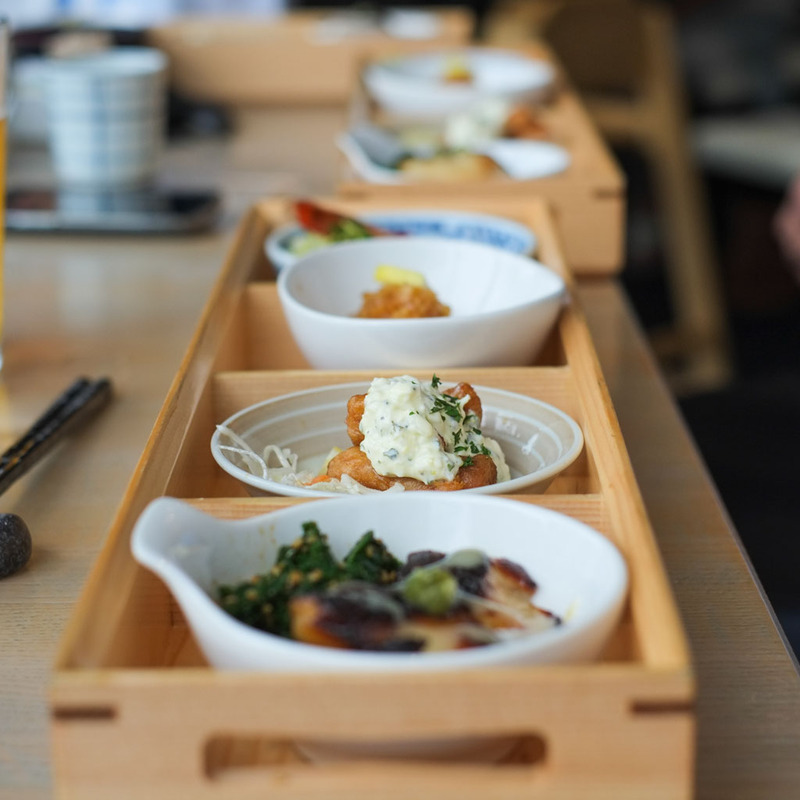 I love the Ebi Fritter and the Saikyo Miso Sablefish. 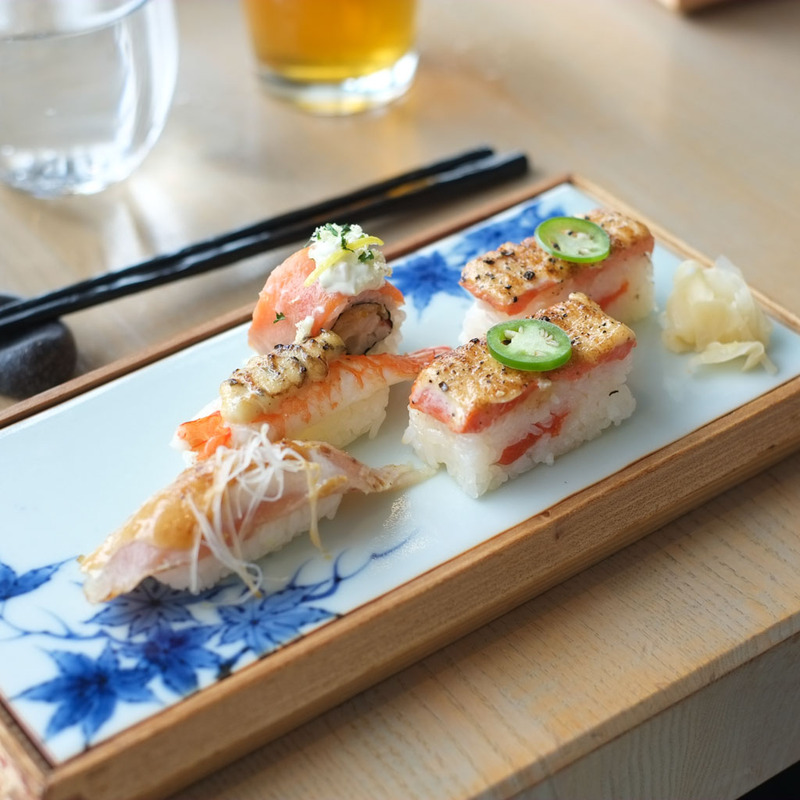 And LOL the Salmon Oshi Sushi might as well be called the Salmon Oishi Sushi because it is one of the most “oishi” pieces of sushi out there!